Beaducation Instructor Barb Switzer always seems to have something new to say with wire. We love how she is constantly coming up with new and creative designs. We asked her to share her thoughts with you on her sources of creativity and inspiration. "When Beaducation asked me to write a blog about creativity and inspiration, I thought it would be a little challenging. I find writing a blog seriously challenging. But fate was on my side and quickly provided inspiration for my blog about inspiration. Whew!" "First up, tools inspire me. Tools? When I get new pliers to test drive, I often find the capabilities of that tool send my work in a different direction. After trying Coiling Pliers for the first time, I developed two projects, Highway Chain and Hinged Frame Cuff that rely on these specific pliers." "Medium and Large Wrap & Tap pliers are the tool I rely on for the Edison Drop, Vite Chain, Fiore Selvatico and the Jeweled Wave Cuff. When I find a tool that allows me to do something new or to carry out a task with greater precision or consistency, it pushes my work to a new level." "My second source of inspiration is student questions. During class, people often are inspired to adapt a design to their own artistic vision. They ask a lot of "what if" questions that make me consider the design in a new light. Recently a friend looked at one of my new designs and mentioned that she thought it would look great with a coil around the outside instead of the seed beads I was using. Coils had been part of my original design, but I couldn't quite figure out a sensible, teachable way to always make the coil fit, so I had used seed beads instead. Last week, I realized that by applying a little simple geometry, I could do exactly what my friend had suggested two months back. Without her comment, I doubt I would have adapted the design back toward my original idea. Never be afraid to ask: Questions = design evolution. My third source of great ideas is materials. If I see a groovy metal finding that looks cool, I buy it, even when I have no clue how I will ever use it. I am almost embarrassed by the number of my designs that use some sort of 3-hole spacer. Let's just say there are at least three projects that use some sort of spacer bar. In the past year I have designed four projects that use crystal rivoli stones because I think they look HOT with wire." 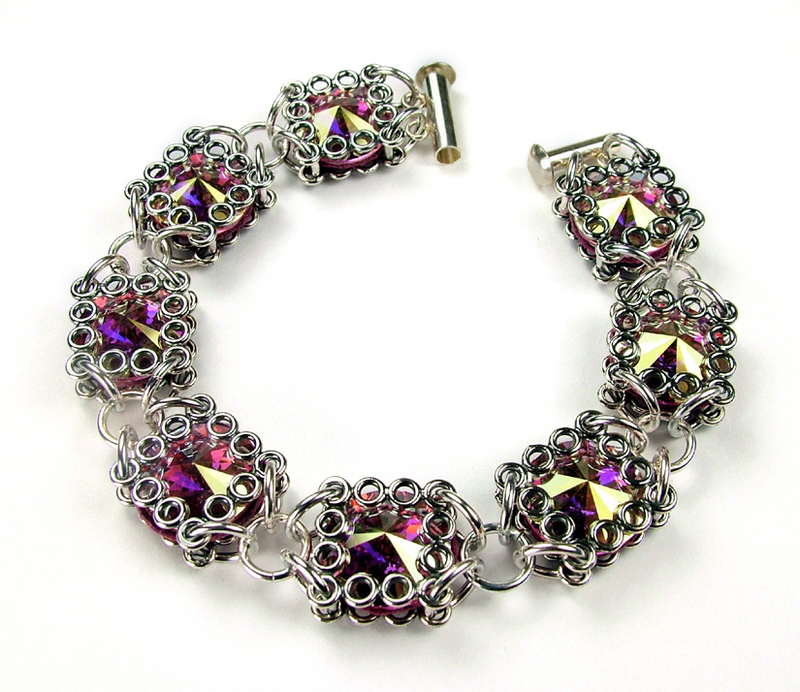 Glam Sandwich Bracelet featuring Rivoli Swarovski Crystals. "Inspiration is a powerful force. It isn't reliable; sometimes when you most need to be inspired, it simply doesn't happen. For this I recommend a little eye candy, like books, magazines or jewelry web sites. Or learn a new technique and challenge yourself to blend new skills with what you already know. You might be just around the corner from your best design inspiration ever. And last but not least (but certainly weirdest): take a long shower. There is nothing that clears my creative mind better than water cascading over my cranium." Let Barb inspire you! 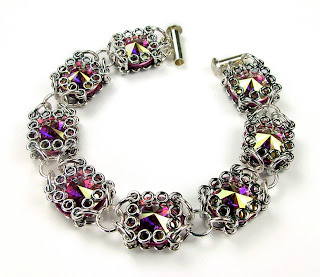 Check out her Beaducation instructor profile and class list. For more of Barb's work including classes and kits, visit her website. Wow, these are truly inspiring thoughts! 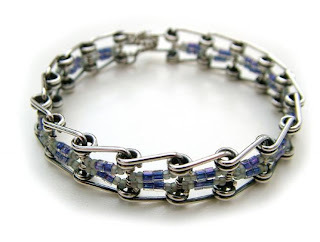 As a jewelry designer for many years, it is always a challenge to continue to push techniques, find time to experiment, and to go back into old supplies and try a fresh take on them. It's so easy to fall in love with our familiar tools and not try something new. I love what you've presented here and will definitely look into some of the tools/techniques you've mentioned!